Along with 78 per cent of Canadians, in high school every morning I ate cereal for breakfast. So when I started commuting almost an hour and a half to university, I got creative...and got made fun of by my fellow freshman. I needed to have my Kellogg's Mini-Wheats, but to save time in the morning, I would throw some Mini-Wheats into a plastic sandwich bag...and bring my milk in a sports bottle. I would throw a Mini-Wheat in my mouth, and swallow it with the milk I brought. True story. And somehow, that year, I still managed to make life long friends. Do you have Cereal and Milk for breakfast? If so, check out this awesome giveaway one lucky YYZ Bambina reader will win! 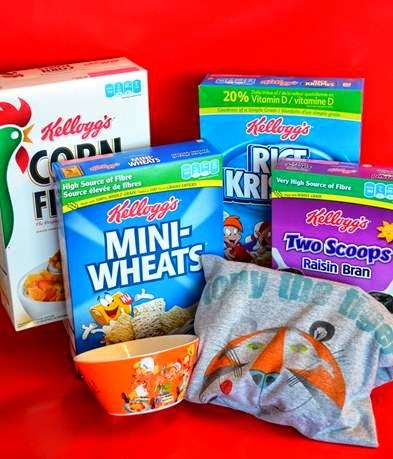 The prize pack is valued at approximately $50, and includes a vintage Kellogg’s ceramic cereal bowl, vintage Kellogg’s t-shirt, and an assortment of Kellogg’s cereals – all to celebrate Cereal & Milk! See below for an example of the prize pack – prize may not be exactly as shown. It would be great to win the Kellogg’s Prize Pack. What is your favourite fact from the infographic? Cereal can decrease your risk of developing Type 2 diabetes. My favourite is the Protein fact. I know it's important to get protein in my diet and this is a simple way. I love that there is so much protein in cereal! I have recently switched over to Kellogg's Special K Protein cereal because of this. I like the fact that a bowl of cereal and milk costs about $0.53 per serving. I like that cereal and milk has more protein than an egg and rye toast. That cereal and milk is budget-friendly at around 53 cents a serving. I found it interesting that a bowl of Special K Protein cereal with milk has more protein than egg on rye toast. That they are good on a budget. The fact that Special K Protein cereal has more protein than an egg. Children who eat cereal for breakfast have healthier body weights. That's good. A bowl of cereal and milk costs about 53 cents per serving. 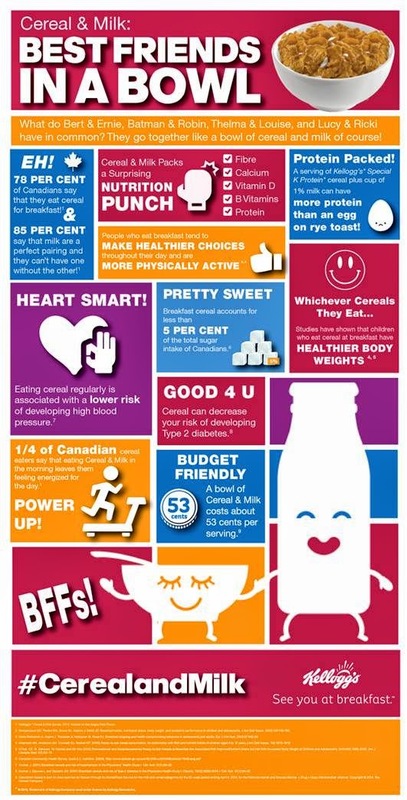 78% of Canadians have Cereal & Milk for breakfast.. that's pretty impressive! My favourite fact is that a bowl of cereal and milk costs about 53 cents per serving. Cereal can decrese your risk of developing type 2 diabetes. Good to know in my family! I like the budget friendly tip. 78% of Canadians eat cereal! all those facts are eye openers. I would not have guessed a lot of them. That cereal can decrease your risk of developing Type 2 diabetes. Less than 5% of sugar in cereal! 78% of Canadians eat cereal for breakfast! Eating cereal regularly is associated with lower risk of developing high blood pressure! My favourite fact is that there is more Protein in cereal than an egg on rye toast! I did not know that! I like the being sweet info - cereal counts for less then 5% of the sugar in our daily carbs. Learning that 78% of Canadians eat cereal for breakfast! The fact is that eating cereal regularly can reduce your blood pressure - sounds like a good reason to me for eating it! Since my dad has type 2 diabetes, my favourite stat is that eating cereal for breakfast can help keep type 2 diabetes risk low. I liked that children who eat cereal for breakfast have a healthier body weight. I found it interesting that a bowl of cereal with milk costs about 53 cents. That no matter what cereal people ate they were at a healthier body weight. Budget Friendly is my favourite fact on the infographic. Only 53 cents a serving! I like the fact that Special K Protein cereal has more protein than an egg. I have tried this cereal and it is really good and does make you feel full. I like that cereal and milk has more protein than an egg and rye toast. I did not know that. I like how visually attractive it is. That it's an easy way to get protein in my diet. eating cereal regularly lowers the development of high blood pressure. People who eat breakfast tend to make more healthier choices. My favorite is the Protein fact. I liked the fact cereal is so cheap at 53cents per serving! I like that they are protein packed. I can't believe that it only costs 53 cents per bowl of cereal!